gies. The practical implications of these results are discussed below. tal Psychology (Smith & Pourchot, 1998) are good examples. these students (Biggs, 1987, 1993; Entwistle & Ramsden, 1983). formance and involve different motivations and strategies. become involved in Lifelong Learning (LL) activities. cation and the factors more directly related to students. ferent study processes depending on “approaches to learning”. extrinsic motivation and fear of failure. sifications through the intrinsic motivations of the subject. become involved in LL activities. between those characteristics and deep learning approach. (59.5%), 62 in Health (38%) and 4 are in other areas (2.5%). of the respondents (1.8%) claim to be in another situation. vel, education area (Education/Health) and professional status. “I completely agree” (+ 2). between deep and superficial strategy. criteria reveal the good psychometric qualities of the instrument. factory adjustment in view of the original model. learning in Higher Education students. tural equivalents underlying the Portuguese translation. anonymity and the individual confidentiality of the results. the procedures were accomplished through inferential statistics. roles performed by older students. their negative correlation with the superficial strategy. grative or inclusive reconciliation with significant learning. only possible by resorting to deep strategies. Correlations between LL and the approaches to learning and its dimensions (motivational and strategic). the responsibility it entails (item 13). not properly aligned with the education objectives. ficult to locate information when I need it”. strategies that facilitate the relationship mentioned. in finding information when they need it (item 11). cial approach the investment of the student is smaller. matters end up not being considered as very important. tively correlated with deep strategy. ment (Rosenhead & Mingers, 2001). come involved in LL activities. taneous tasks for which fast and efficient solutions are required. location of information and adaptation of learning strategies. of learning” (Pacheco, 2011: p. 49). shown in the strategic dimension of deep learning. the teachers (Biggs et al., 2001). present a significant contribution to this purpose. Biggs, J. (1993). From theory to practice: A cognitive systems approach. Higher Education Research and Development, 12, 73-86.
tralian council for educ a t ional research. Hawthorn: Victoria. ties and CAEs. Vestes, 27, 3-9. DGES (2013). ECTS: European credit transfer system. 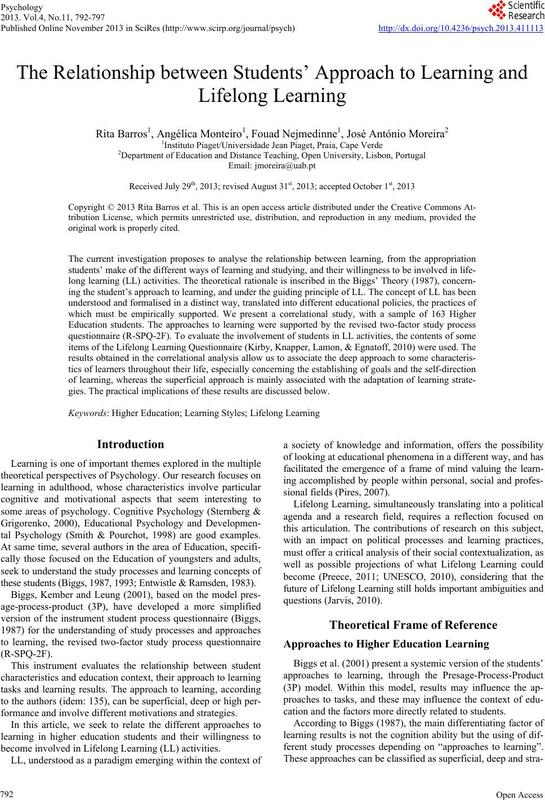 search on teaching and learning in higher education (pp. 15-57). Montreal and Kingston: McGill-Queens University Press. Entwistle, N., & Ramsden, P. (1983). Understanding student learning. (pp. 93-132). Lisboa: Universidade Aberta. model. Adult Education Quarterly, 48, 18-33. Journal of Lifelong Education, 29, 397-400. 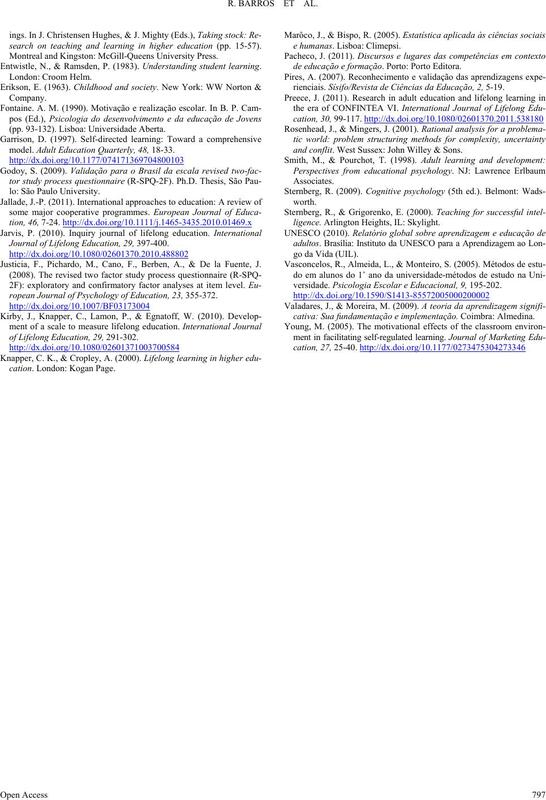 Justicia, F., Pichardo, M., Cano, F., Berben, A., & De la Fuente, J.
ropean Journal of Psychology of Education, 23, 355-372.
of Lifelong Education, 29, 291-302.
de educação e formação. Porto: Porto Editora. rienciais. Sí sif o/ Revista de Ciências da Educação, 2, 5-19.
and conflit. West Sussex: John Willey & Sons. ligence. Arlington Heights, IL: Skylight. versidade. Psicolo gi a Escolar e Educacional, 9, 195-202.
cativa: Sua fundamentação e imp le m en ta çã o . Coimbra: Almedina.